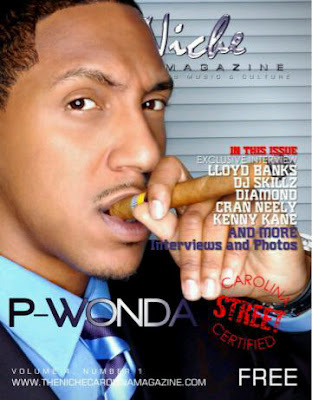 In the just released edition of The Niche Carolina Magazine Greensboro, NC native P. Wonda graces the front cover. Inside the magazine there’s an in-depth interview with the power house indie artist done by yours truly. Hard copies of The Niche Carolina Magazine Volume 4, Number 1 can be picked up for free at many locations throughout NC and SC. Click here to read the online version. Below is the latest visual from P. Wonda, “Fell Back” featuring Chicago’s GLC on the track. After the jump you can also listen to the audio from P. Wonda’s live in-studio interview, download his Wondabread mix CD and peep the video for “All My G’s” featuring Blac Boi, Tigo B, and Ricky Ruckus. Many thanks to The Niche Carolina Magazine, One Love Marketing Group, Othaz Record and Monalis360 for the opportunity and support.